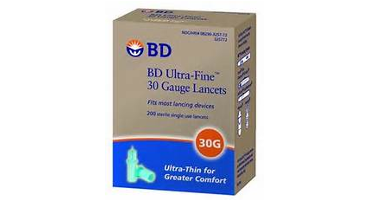 BD Ultra Fine 30 gauge single use lancets are designed to be virtually painless. The 30 gauge lancets are available for maximum comfort during diabetic testing. Fits most lancing devices including: Medisense, Microlet, Penlet Plus/One Touch UltraSoft, Prestige LX, OneTouch, Freestyle, Microlet 2, and many more! Non-toxic and non-pyrogenic.